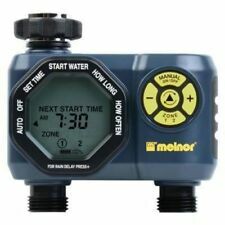 Melnor HydroLogic Advanced Four-Zone Electronic Water Timer. Shipped with USPS Priority Mail. All of their products are truly built to last! -Water up to 4 areas from one faucet. 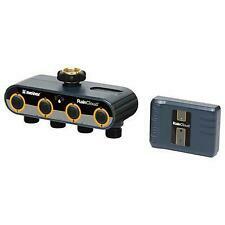 -Retains programming through battery change. Trending at $55.82eBay determines this price through a machine learned model of the product's sale prices within the last 90 days. Trending at $47.89eBay determines this price through a machine learned model of the product's sale prices within the last 90 days. Need to wash the car or spray off the walkway. Manual mode allows you to turn on the water whenever you need it. Angled valve design makes it easy to attach multiple hoses, without hurting your knuckles. 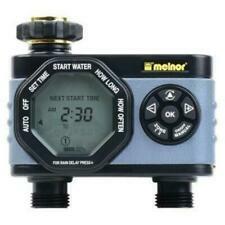 Melnor Aqua 4 Hose Timer. Condition is New. Shipped with USPS Priority Mail. New ListingMelnor 3100 Automatic 2 Outlet Digital Aqua Timer Watering System -Tested!! Water four areas with one faucet. The ability to schedule zones allows you the convenience to water the lawn once a week, the garden daily, and newly planted flowers more often. It’s perfect for mixed plantings. Melnor Digital Water Timer. Condition is New. Shipped with USPS Priority Mail. Melnor 3100 Automatic 2 Outlet Digital Aqua Timer Watering System -Tested!! 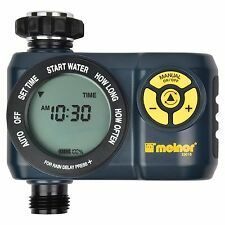 Melnor 3100 Automatic 2 Outlet Digital Aqua Timer Watering System -Tested!!. I no longer need it. Regular wear from usage. Works as it should. Batteries and manual not included. Sold as pictured Condition is Used. Shipped with USPS Priority Mail. Sealed in original packaging. Model number 557-869. Please review the attached photos before purchasing. Thanks so much for your interest in this item!! Waters 4 areas from 1 faucet simultaneously. Each zone is independently programmable. Requires 2 AA batteries, not included. Each watering area has its own schedule. .found in my dads stuff, never used. Need to wash the car or spray off the walkway. Manual mode allows you to turn on the water whenever you need it. Compatibility Type Drip and Soaker Hose Compatible,Garden Hose Compatible. Angled valve design makes it easy to attach multiple hoses, without hurting your knuckles. 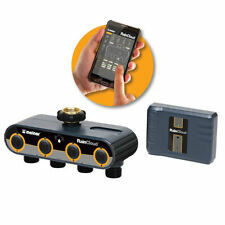 Melnor RainCloud Add-on Extra Smart Water Irrigation Timer Valve Unit 15132. Shipped with USPS Priority Mail. Open box but item is sealed in plastic. Box is a little rough around the edges which is why this is listed as new other. You lawn & garden are watered. Select how long each morning to water. Water daily without programming. To water manually set to "on". You are bidding for a brand new item. Thanks for viewing. Programmable: Yes. Number of Zones: 4 zone. cause both cancer and birth defects or other reproductive harm, which are known to the State of California to cause cancer or birth defects or other reproductive harm. 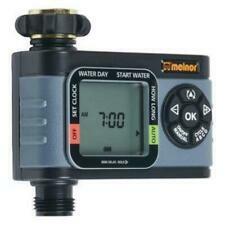 MELNOR..HYDROLOGIC..DIGITAL..4 ZONE..PROGRAMMABLE..WATER TIMER. Shipped with USPS Priority Mail. EASILY SET FREQUENCY AND DURATION OF BOTH OUTLETS. MODEL 3100. SETS UP IN LESS THAN A MINUTE. Seven year warranty. -Water up to 3 areas from one faucet. -Rain delay. -Retains programming through battery change. Manufacturer Part Number 73280. Atlanta Network Technologies, Inc. Manufacturers change colors and item details frequently and often do not update pictures. We have no personal knowledge or experience with this product or ability to customize it. No need to dig up your yard for an inground system: Raincloud works with standard garden hoses, drip systems, soaker hoses and all types of sprinklers. Program 4 Zones Via Smart Phone, iPad, Or Computer.